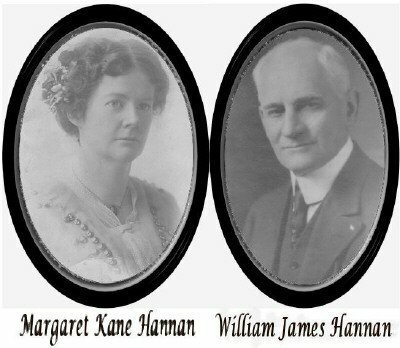 William James HANNAN was born 03 Jul 1862 in Chicago, Illinois. His father, John HANNAN, was born about 1837 in Ireland. His mother, Margaret POWERS, was born in County Wexford, Ireland, also about 1837. He had an older brother, John HANNAN, who was born in May 1860 (according to the 1860 U.S. Census) in St. Louis, Missouri, where their father worked as a limestone cutter until about 1861. There was a sister, Catherine HANNAN, who was born about 1865 in Chicago. The family appeared in the 1870 Census in Chicago (Ward 1) where John Sr. was a Saloon Keeper. He died very young (about 39 years) on 09 Oct 1874. Catherine was just 13 when she died in August 1877. Margaret died 28 Mar 1902, while living at 437 30th Street, and was buried at Calvary Cemetery on Chicago Avenue with her husband and daughter. Her son, John, may have predeceased her as he is not mentioned in her death/funeral notice. William appears first as a single man in the 1880 Census in Chicago, where he was a servant at the Sherman Hotel. In the 1888 Chicago Voter's Registration he was living at 74 N. Sangamon Street. 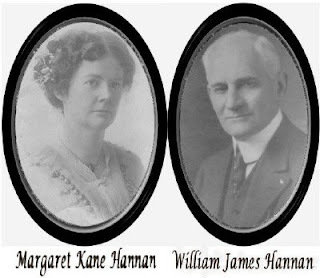 William married Margaret Beatrice KANE 17 Nov 1892 in Dixon, Lee County, Illinois. He and his family appeared in the 1900 Census living at 278 Bowen Street next door to Margaret's parents, James KANE and Julia McCORMICK. In January 1905 the family, complete with four daughters; Marion Julia HANNAN (born 12 Mar 1894), Genevieve Mae HANNAN (born 19 Feb 1897), Margaret Beatrice HANNAN (born 03 Jun 1899), and Virginia Agnes HANNAN (born 24 Jan 1905) were living at 4252 St. Lawrence Avenue. They appeared in the 1910 Census at 4124 Vincennes Avenue. In 1917 William, Margaret, Marion, Margaret, and Virginia, moved from Chicago to Denver, Colorado. (Genevieve remained in Chicago and married Charles David TULLIS.) The family appeared in the 1920 Census residing at 1516 Milwaukee Street, where William was a self-employed real estate salesman. They were living at 5301 E. 12th Street in Denver for the 1930 Census, where he was a collector for a grocery store. In 1940 William and Margaret moved to Boulder, where their daughter, Margaret, and her family had moved a few years prior. William and Margaret separated shortly thereafter. William went to live with his daughter, Margaret, and his wife, Margaret, stayed in their rented home. Margaret died 02 Aug 1945, after a lengthy illness, and William passed away just 10 days later from the effects of a stroke. They are buried at Green Mountain Cemetery in Boulder alongside several family members. Their daughter Margaret married Ernest Talfred HILL in 1922. In 1928 Virginia married Lewis Lavern GREENO; both families remained in Denver for several years. Marion never married but worked as a dental technician in Denver until her retirement. She was a devout parish member of the Cathedral Basilica of the Immaculate Conception for 50 years. William was described as a slender 5 feet 11 inches with twinkling blue eyes, premature gray hair, and a dapper way of dressing. He was a letter carrier in Chicago for as many as 34 years. My great grandparents died many years before I was born. My father, uncle, and a cousin shared some of their memories of William and Margaret with the family. However, no one seems to know what happened to most of their belongings and photographs.